A third generation French international behind his father and grandfather, Elissalde began his career with La Rochelle in 1997. He made his French debut as a replacement against Scotland in the 2000 Six Nations. He was a surprise call up to the squad as cover for the injured Richard Dourthe. He has gone on to make a name for himself as one of the most consistent and dangerous kickers in the northern hemisphere. Elissalde made the switch from his hometown side to Toulouse in 2002, where his ability to play in both half-back roles was not enough to guarantee him a regular place in the starting XV due to the presence of Frederic Michalak and Yann Delague. He missed out on a place in the squad for Toulouse's 2003 Heineken Cup victory. 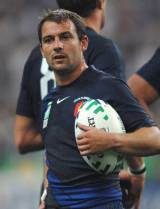 He has been employed almost universally as a scrum-half at international level, but he was unable to force his way into the 2003 French World Cup squad. Elissalde bounced back from this disappointment with a strong showing in the 2004 Six Nations, scoring 36 points in his three starts, including a 24 point haul against Wales. Elissalde suffered a serious thigh injury during the Wales game, but played on. This lead to fierce criticism from Toulouse coach Guy Noves, who would be without his player for the remainder of the season. Despite his injury layoff, Elissalde continued his good form into the autumn, contributing 17 points with the boot to send France to a 27-14 victory over Australia at the Stade de France. Elissalde would not be in action for France again until the summer tour to South Africa in June 2005, kicking seven points in the 30-30 first test draw. He again missed a Heineken Cup victory for Toulouse in 2005, this time with an injury picked up in training. The 2006 and 2007 Six Nations were successful for both Elissalde and France, with two championship successes finally establishing Elissalde ahead of Dimitri Yachvili in the French squad. Elissalde went to the 2007 World Cup in good form, but was left on the bench for the opener against Argentina. Following a terrible display by his replacement Pierre Mignoni, he was restored as the French made it to the semi finals. Elissalde was limited to three appearances in the Six Nations in 2008, including the championship deciding loss to Wales in Cardiff. He was again disappointed in club colours in May 2008 as he started his first Heineken Cup final for Toulouse, but was on the losing side of a 16-13 scoreline against Munster. He played his last Test in November 2008 against the Pacific Islands and after a number of seasons interrupted by injury called time on his professional career in 2010, following Toulouse's victory in the Heineken Cup final against Biarritz.